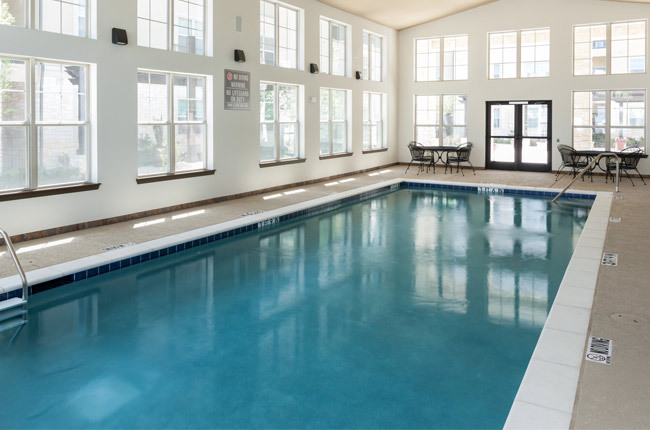 Heritage Village Residences, the premier apartments in Hurst, Texas for residents 55 and older, grants residents with a luxuriously elegant environment of tranquility and recreational activity—perfect for beginning the next chapter of their lives. At Heritage Village Residences, our apartment community supplies a continuous rhythm of energy and style. Our goal is to provide our residents with amenity-rich, contemporary living as well as an endless supply of entertainment opportunities. Our modern appliances, accented by rich textures and finishes, contribute to our distinctive interiors, giving them an air of quiet cultivation. Residents of our community will also enjoy a heated, indoor swimming pool, a state-of-the-art theater, and a convenient beauty salon. When you long for fresh air, we offer a beautifully landscaped courtyard and a gazebo complete with grilling stations. If you’re looking for classic design with modern sophistication, come home to Heritage Village Residences today. Heritage Village Residences is ideally located on Heritage Circle, providing residents with a central location in the heart of Hurst, Texas. Our gated, pet-friendly apartment community grants residents with all of the convenience they could possibly desire. We boast close proximity to the Hurst Public Library as well as the local post office. And shopaholics will not have to travel far to indulge in their favorite hobby. North East Mall, a 150-store indoor mall that features popular retail brands and delicious restaurants, is located within the immediate area. Outdoor enthusiasts will enjoy nearby Hurst Community Park with its multi-use trail system, picnic area, and stunning wooded scenery. Best of all, it is simple to explore Hurst with Interstate 820 and the Texas 183. Experience all of the benefits of our convenient location, exceptional services, and remarkable amenities today.